I thought I would share my new rock iguana. 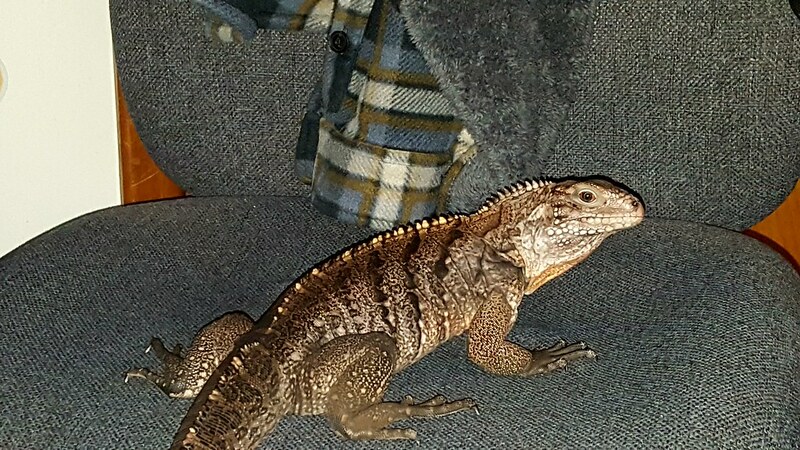 I got him in November and only after years of wanting a rock iguana and researching the different breeds available, did I choose to purchase one. The decision to get a Cuban was based on the general consensus, at least from my research, that this species usually quite tame. I did not get him to breed, he is going to be a pet. In the two and a half months that I have had him he has already changed significantly. He was very nervous and flighty when I got him but already he seems to enjoy human interaction. He eagerly eats from my hand and allows me to pick him up with no resistance. He likes a good scratch behind his head and will close his eyes and allow me to pick at shedding skin. 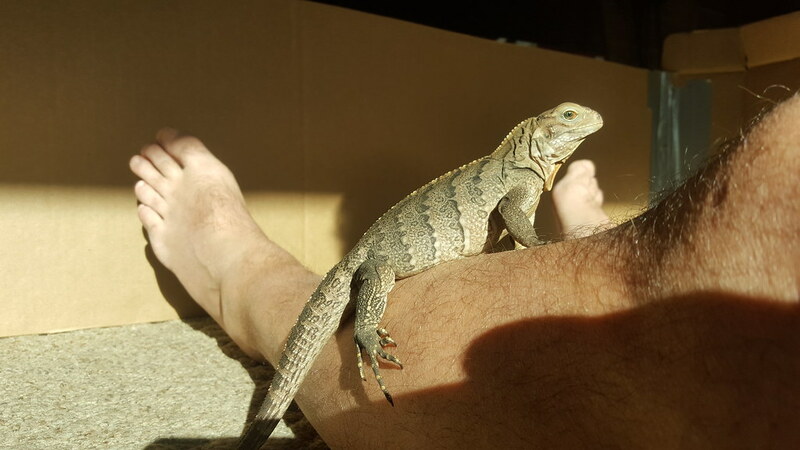 He is almost always shedding because he is growing constantly, he is already about 18" long. At this point he will wait for me to take him out of his cage and go to the bathroom on a piece newspaper in his training enclosure. If the sun is shining in that room he will climb up on my leg and sprawl out as long as I let him. Eventually, when he is housebroken, he will have free run of the house. 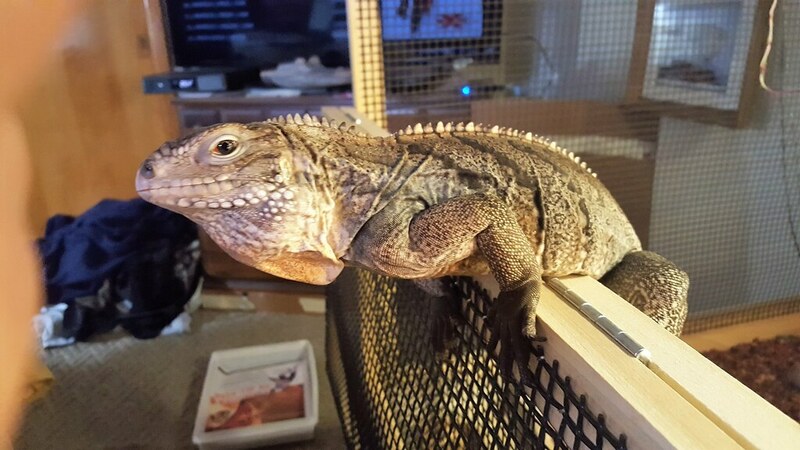 I plan to do this in small increments, increasing his limits while allowing him to learn where his basking spots, food, water, bathroom, and sleeping spaces are. So far he has shown intelligence and the desire to be around me without fleeing away. I can't wait for him to become a valued member of our family like my late dog was. I realize the majority of posts here are more scientific and related to husbandry and breeding. I thought this might just be different and interesting to a few folks. Here is when I got him. This is a recent picture of him hanging out. That is awesome! I've always thought the rock iguanas were really cool. Never kept any, but maybe one day. So it is a for-sure male? I'm just curious- was he scoped or is that just the 'default' gender you refer to? Do the male rocks have the behavior issues when maturity is reached, like the green iguanas are known for? I really don't have much iguanid experience, so I am genuinely asking. I'm looking forward to seeing how he turns out, both physically and behaviorally! Nice acquisition! Thanks Berkley. I requested a male and the breeder said he probed this one and it is a male. He told me it's not 100% for sure but he feels strongly that it is. 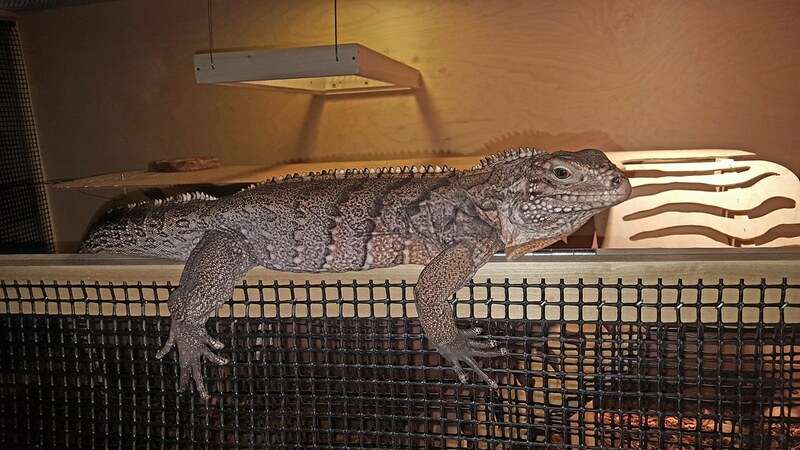 I'm sure there are exceptions but from what I gathered the cyclura don't get aggressive like male green iguanas. Only time will tell, but either way I will deal with it. According to some the Cuban's are possibly the tamest in their clan. So far he has not even opened his mouth except to eat. His parents are quite tame according to the breeder. I will keep you updated. That is awesome! I'm looking forward to seeing how he turns out! 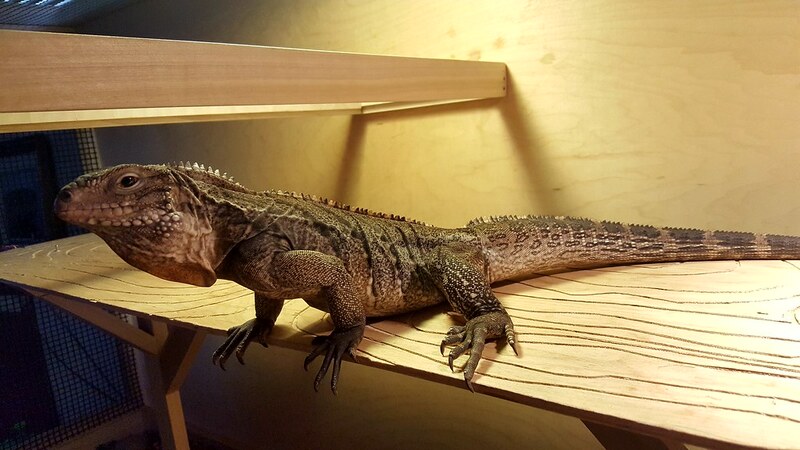 I've been wanting to do a large outdoor enclosure with cyclura for years. Some day. 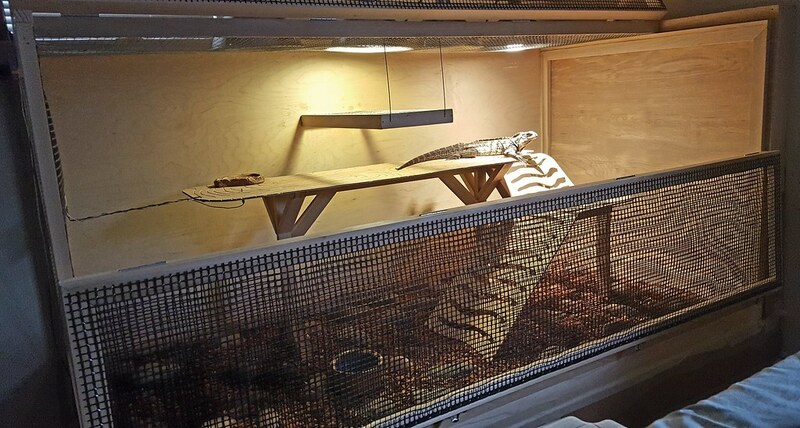 nightdriver wrote: I've been wanting to do a large outdoor enclosure with cyclura for years. Some day. I would if the weather here was conducive. Maybe I will end up farther south and that would be an option. I figured it was time for an update on my Cuban. He is just over a year and a solid 2' long. He has already out grown his original digs. I custom built his new home. It's 6'x3'x3'. It features many levels and multiple lighting/heating. I read somewhere that changing their home can be stressful and it took him almost 2 weeks before he seemed himself again and eating normally again. However his personality bloomed once he got settled. 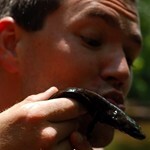 It is amazing how much personality these guys display when they acclimated to people. He no longer feels threatened and comes to me to be scratched. If I open his cage he is going to interact with me. If other people come by to see him he gives them a look over but will eventually come to meet them. He never shows aggression. He does like to bob his head at my girlfriend and other females who visit. It is extremely rare that he gestures to me like that. He is trained to use his litter box and If I put him in it he uses it regularly. I'm still working on training him to go to it on his own. He has free range of my bedroom when I am present and it has been "Belvie" proofed. Any nook or cranny that he can slip into has been sealed with cardboard to prevent him from going where he is not supposed to go. This has been going on for about a month and he already figured out how to get back to his home to warm up. He does it all on his own. In the time it took me to post this he has jumped up on my lap 3 times to see what I'm up to. He checks out any project going on while he is out and about. Make that 4 times he came up to visit. When I was away for a week, I think he missed me. When I got home he didn't wait for me to open his cage. He saw me and quickly jumped up to the top corner to greet me. He let me scratch him for a long time then. I have worked with a lot of different reptiles and my rock iguana is by far the most rewarding and interactive herp I have ever worked with. The best part is that he is still just a yearling. I can't wait to see just how far his intelligence will take him. Beautiful animal and I love that smart ergo for a good saunter, love your posts! A handsome fellow he is. What are you feeding him? He looks great! I'm glad to hear he is progressing right along. The enclosure looks really cool too. nightdriver wrote: A handsome fellow he is. Mostly he eats dark greens like collards and broccoli leaves. Other greens include dandelion, chard, bok choy, mixed greens, and rarely a little spinach. Occasionally he gets some flowers. He does not fancy fruit and rarely eats any. I also give him adult bearded dragon veggie treats. They are like Scooby snacks to him. I also use food grade alfalfa and Repashy super veggie supplements. Berkeley Boone wrote: He looks great! I'm glad to hear he is progressing right along. The enclosure looks really cool too. Thank you, you know how I like to make custom enclosures. I really believe that letting him out of his house has greatly increased his confidence. It's funny some days he comes out and spends hours exploring and then like today, I let him out, he did his business in his litter box and then he climbed right back into his cage.